I know I'm not alone when I say that I love to layer. 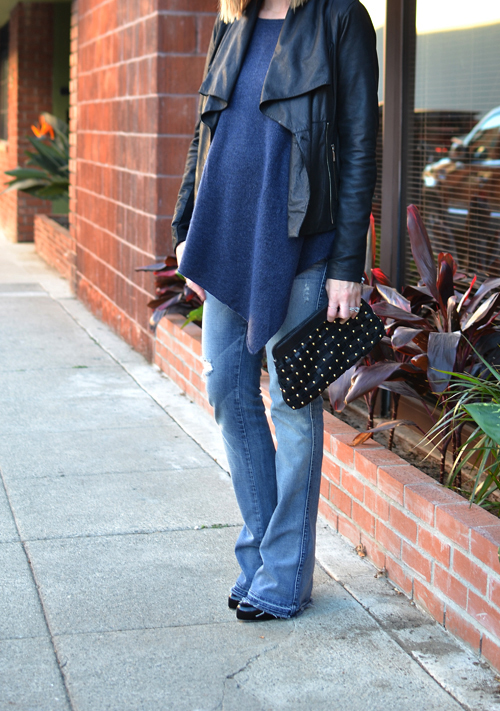 My belly is growing by the day, so I'm all about loose, comfy knits paired with jeans and delicate jewelry. Thanks to the cool evenings we've been having, my favorite leather jacket has been getting a ton of use. Since I love the combination of black and blue, it was the perfect piece to layer over my super cozy, asymmetrical sweater. Draped leather is so pretty~ love this jacket! You're going to be such a yummy mummy. i am obsessed with that draped jacket!!! black & blue is one of my fave combos! lookin good girl! beautiful jacket! Love the clutch too! Oh goodness. What a cute bump! You dress it up gorgeously. love that leather jacket! you look fabulous! Love the loose layers here - this leather jacket is exactly what I've been looking for...do they not make this particular style anymore? Thanks Kim! This jacket was a birthday gift from my husband 2 years ago. Sadly, I don't think this exact style is available anymore. You look SO chic! Love the jeans and leather jacket! Love the draping around the belly, you are too cute for words! Love this so much, Audrey! Love the draping of the jacket -- and that sweater is perfect! So chic and comfy looking! P.S. The hair is looking ah-ma-zing! I love how you are managing to stay so stylish while pregnant... it really is inspiring! Love your new haircut too! I want that jacket! I've been looking for something similar, but so far no luck! Cool jacket! I love your shorter hair! Your hair is amazing lady! Love all the layers and drapey pieces. So comfortable chic! I love the sweater and jacket together! I didn't have the cutest clothes the last time I was pregnant. I am definitely taking notes for the next time. I absolutely love that drapey leather jacket!! You know, I hope I look as glow-y and adorable as you do when I'm pregnant! Your comfy, casual look is effortless. Love it. I hope all is well, Audrey! Great look, and that leather jacket is awesome. You are a stylish pregnant woman, love your look!! Look at the belly and the haircut :).. love this look! Best dressed pregnant woman on the planet. Wait. Scratch that. Just the best dressed woman PERIOD. I really love your style girl. This is gorgeous! I love how it's casual, yet glamorous. I would totally rock this with my next pregnancy!